Why carry your meal to the table when it can instead be served via a miniature rollercoaster direct from the kitchen to you? After all, you've been on the rides so why shouldn't your food have a go too! 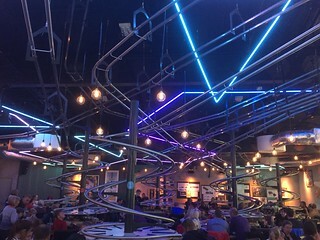 The restaurant's rollercoaster hardware features two loop-the-loops as well as an 8 metre drop down a tornado spiral, with the tracks bringing ta varied range of food to diners sat at one of the 13 tables spread around the room. 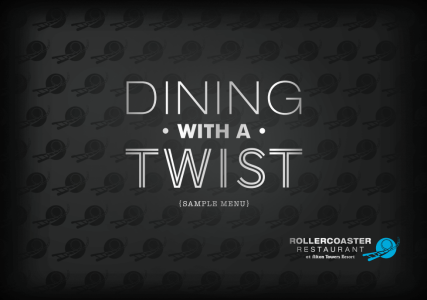 The walls of the restaurant are lined with memorabilia from the various rollercoasters from throughout the park's history and each table setting is named after one of the park's coasters. The restaurant is open for breakfast at 10am and serves lunch until 4pm before switching to dinner reservations between 5pm and 10pm as another dining option for resort guests. This new restaurant opened in May 2016 and took over the building which used to house the Air Shop and brought an interesting new dining experience to both park and hotel guests.